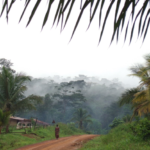 Reliable data on the status and trends of forest genetic resources are essential for their sustainable management. 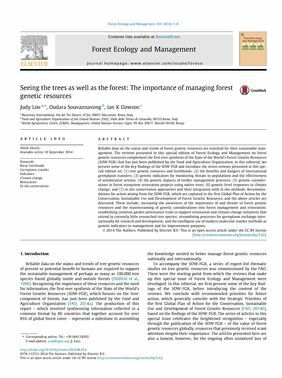 The reviews presented in this special edition of Forest Ecology and Management on forest genetic resources complement the first ever synthesis of the State of the World’s Forest Genetic Resources (SOW-FGR) that has just been published by the Food and Agriculture Organization. In this editorial, we present some of the key findings of the SOW-FGR and introduce the seven reviews presented in this special edition on: (1) tree genetic resources and livelihoods; (2) the benefits and dangers of international germplasm transfers; (3) genetic indicators for monitoring threats to populations and the effectiveness of ameliorative actions; (4) the genetic impacts of timber management practices; (5) genetic considerations in forest ecosystem restoration projects using native trees; (6) genetic-level responses to climate change; and (7) ex situ conservation approaches and their integration with in situ methods. 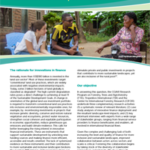 Recommendations for action arising from the SOW-FGR, which are captured in the first Global Plan of Action for the Conservation, Sustainable Use and Development of Forest Genetic Resources, and the above articles are discussed. These include: increasing the awareness of the importance of and threats to forest genetic resources and the mainstreaming of genetic considerations into forest management and restoration; establishing common garden provenance trials to support restoration and climate change initiatives that extend to currently little-researched tree species; streamlining processes for germplasm exchange internationally for research and development; and the intelligent use of modern molecular marker methods as genetic indicators in management and for improvement purposes. Author: Loo, J.; Souvannavong, O.; Dawson, I.K.